The Chapel Car Bride is an engaging story! Offering a vivid glimpse into the past, I delighted in the details shared concerning chapel car ministry and coal mining. I love learning bits of history when I read! It was a pleasure to meet Hope Irvine and her father, endearing characters with hearts for service and helping others. With elements of drama, intrigue, and romance, I enjoyed this journey back in time and look forward to reading more from Judith Miller. I received a complimentary copy of this book. No review was required, and all thoughts expressed are my own. With her penchant for seeing the best in everyone, Hope Irvine sees a world full of good people in hard places. 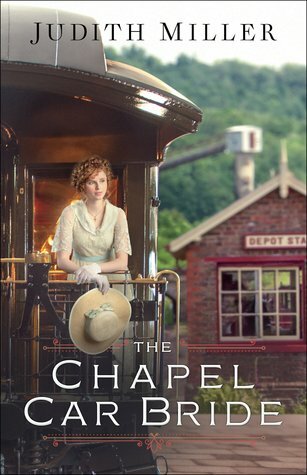 When her father accepts a position traveling in a chapel car as an on-the-rail missionary, she is determined to join him in his efforts and put her musical skills to good use by serving the mining families of West Virginia, saving their souls, and bettering their lives. Luke Hughes shares Hope’s love of music and her love of God, but as a poor miner he knows he can offer her no future. Still, the notes she sings resonate in his heart. When she begins to travel with a young mine manager to neighboring counties, Luke can hardly suppress his jealousy. It isn’t until he begins to suspect these missions of mercy might be the mine manager’s cover for illegal purposes, though, that Luke feels justified in speaking up. But how can he discover the truth without hurting Hope or, worse, putting her in danger?